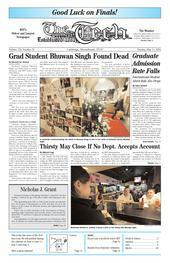 Graduate student Bhuwan Singh was found dead on Friday afternoon, said MIT Police Chief John DiFava. The Thirsty Ear Pub will close on June 1 unless it can find an office within the MIT administration that is willing to host the pub's accounts, said John P. Lock G, the representative from the Graduate Student Council on the Pub Oversight Committee. Professor Emeritus of Metallurgy Nicholas J. Grant ScD '44 died on May 1, 2004 at the age of 88, after a battle with Alzheimer's disease. Out of 296 pledges received by fraternities in the fall, 265 have been initiated and approximately 80 percent of these initiates are moving into fraternities this fall, said David N. Rogers, assistent dean and director of Fraternities, Sororities, and Independent Living Groups. The Class of 2008 is currently over-enrolled, and Dean of Admissions Marilee Jones predicts that the actual class size will exceed the enrollment target of 1,030 by about 60 students.